This is an essential factor to the success of our Vandal sail designs. 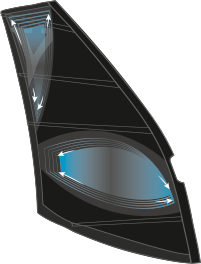 The bionic concave panel layout is the triangular curve design around the sails window. This panel layout makes for the perfect distribution of power over the seams within the sails body creating better stability, durability and overall performance.